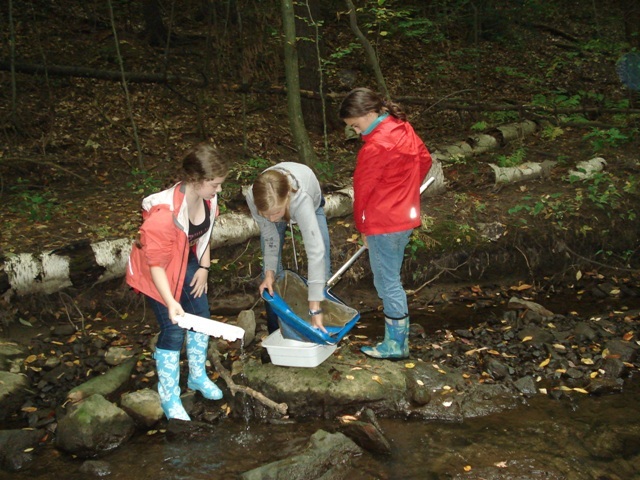 LCSG aquatic science education programs engage and educate students and teachers about watersheds, water quality and aquatic resources. Place-based education programs weave together classroom instruction, water quality monitoring and community service, and frequently partner schools with community-based watershed groups. Our ultimate goal is to ensure that every student in the basin is aware of the importance of water resources, the problems facing basin residents, the causes of those problems, and potential solutions. Reaching this goal will require that water resources education is part of the curriculum of every school in the Lake Champlain Basin. We can prepare students to use their knowledge to promote personal and community responsibility for pollution prevention, water quality protection and aquatic resources stewardship - today and in the future. Follow the links below to find out more about LCSG's efforts to increase aquatic science literacy. The University of Vermont Extension Watershed Alliance is an Extension program in partnership with Lake Champlain Sea Grant and the Rubenstein School of Environment and Natural Resources. For more information on the UVM Extension Watershed Alliance, contact the Watershed and Lake Education Coordinator, Ashley Eaton. The Champlain Basin Education Initiative (CBEI) is a consortium of environmental education groups throughout the Lake Champlain Basin. CBEI holds workshops on teaching about the Lake Champlain Basin for K-12 educators, education majors, and interested citizens. The workshops feature diverse and exciting presentations by local experts on topics such as current events, water quality, fish and wildlife, lake history, and field explorations/monitoring. Since 1992, more than 650 educators have participated in CBEI workshops and forums. A Watershed for Every Classroom. For more information, visit WatershED Matters, a website of CBEI for basin-centered education. UVM Extension Watershed Alliance also provides internship opportunities to UVM undergraduate students who wish to gain valuable, hands-on experience and training in environmental education. Interns serve as Watershed Educators, providing educational programming in schools and other academic settings throughout Vermont. All of UVm Extension Watershed Alliance's programs include both classroom and field components, and center on science as inquiry. For more information or to apply, contact Ashley Eaton, Watershed and Lake Education Coordinator.